The Ready Battalion is back in action. 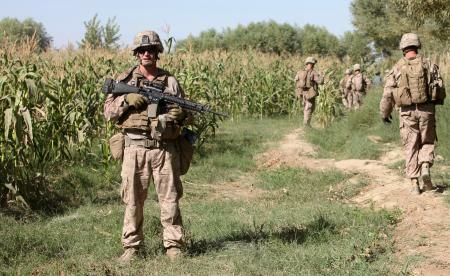 Second Battalion, 6th Marines, out of Camp Lejeune, N.C., has replaced 1st Battalion, 9th Marines, in Afghanistan and is now patrolling Nawa district in central Helmand. Its a mission that will likely be complicated by the Corps’ pending drawdown in Afghanistan — Nawa is one of the next three districts in Helmand in which the security has been identified for transition this spring to Afghan control. The Walking Dead of 1/9 were formally replaced by 2/6 in a ceremony at Forward Operating Base Geronimo late last month, but were still in theater through Christmas. Gen. Joseph Dunford, assistant commandant of the Marine Corps, and other general officers visited 1/9 and other units on Christmas at Camp Dwyer as the battalion transitioned out of Afghanistan. The area of operations includes not only Nawa, which has largely been pacified, but more violent regions to the west in Trek Nawa and to the south in Shorshorak. They battalion also demilitarized several bases and launched new advisory teams as the Afghan Local Police became more useful, according to this Marine Corps news release. Did it in Marjah! Now go get em devils cowboys!! Thanks for your service.God, be with you. Take care!